Here you will be asked to select a gun from a drop-down menu. 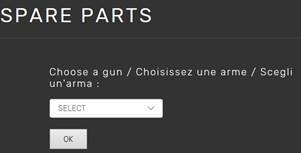 Once you have selected the appropriate gun for the part you are looking for, a detailed parts-map will be displayed. Enter the number displayed on the map that corresponds to the part you are looking for. This will display a detailed list of parts to use for ordering.